This jeep came to us with just primer. It looked plain and desperately needed a color wrap. Luckily Fast-Trac Designs was able to help and we put our 3M certified installation skills to work. The client chose Blue Raspberry 3M 1080 series film. 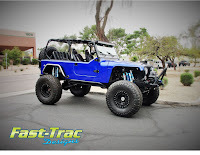 It was awesome to see this jeep transform, all of the other attributes of the vehicle began to flow and stand out. This color was perfect and THIS is a very unique Jeep. Labels: Color Change, Fast-Trac Designs Custom Boat Wraps.